September 5, 2015 11:56 p.m.
September 6, 2015 12:09 a.m. 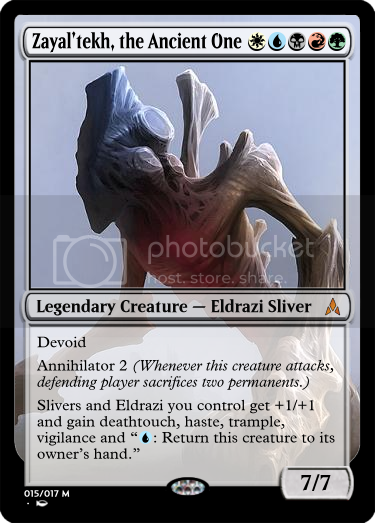 Create a Theros-type God cards that interacts with Eldrazi. September 6, 2015 4:10 a.m.
Colorless spells cost X less to cast, where X is the amount of colorless nonland permanents you control. If you cast a creature without paying its mana cost this turn, tap all of your lands. September 6, 2015 9:13 a.m.
As long as your devotion to colorless is less than 15, Kos is not a creature. 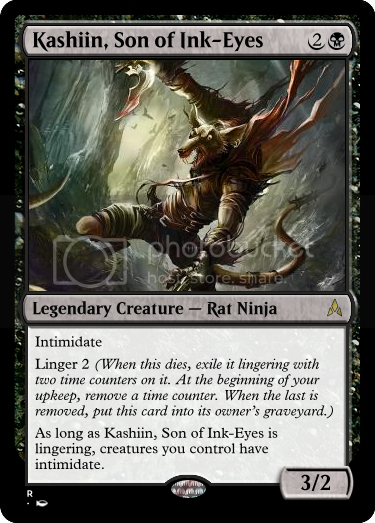 Whenever a nontoken colorless creature enters the battlefield, exile the top five cards of each opponent's library. You may cast non instant, nonsorcery cards either player owns from exile. You may cast them without paying any colored mana in their mana cost. Create a shapeshifter with no ability to copy other permanents and is not a changeling. September 6, 2015 9:15 a.m.
September 6, 2015 9:17 a.m.
September 6, 2015 9:18 a.m. Tap: ~ deals 3 damage to target creature. : ~ loses all creature types, choose another creature type. Make a Flavorful multipurpose artifact. September 6, 2015 9:34 a.m. Edited. T: Target player puts the top card of his or her library into his or her graveyard. September 6, 2015 5:43 p.m.
10 tap- search you library for two card and put them into your hand, you may play them without paying their mana cost. If any of those cards are creatures, they gain haste. Make an equipment artifact better then the swords, that shoots pies. September 6, 2015 8:57 p.m.
Hypersonic Pie Cannon enters the battlefield with X pie counters. Equipped creature gets +X/+X, where X is the number of pie counters on Hypersonic Pie Cannon. -Hypersonic Pie Cannon deals 2 damage to target player. -Target creature gets -2/-2 until end of turn. : Put a pie counter on Hypersonic Pie Cannon. September 7, 2015 12:26 a.m.
Make a card that punishes players for casting spells with X in their mana cost. The higher the X, the harsher the punishment. September 7, 2015 7:59 a.m. Whenever a spell resolves, the spell's caster must pay X life or discard X cards, where X is the amount of mana paid for that spell minus that spell's converted mana cost. September 7, 2015 8:07 a.m. Counter target spell with X in its cost. ~ deals X damage to that spell's controller. ~ costs less for each mana spent this turn by that spell's controller this turn. No, my Wurmcalling has backfired! Artifact creatures without keywords get +2/+2. September 7, 2015 8:12 a.m. Edited. Next: A card that makes your opponents cry when you scry. September 7, 2015 8:35 a.m.
Each creature you control has "Whenever you scry, you may tap this creature. If you do, you may cast one of the cards you scryed without paying its mana cost unless an opponent pays ." Next! Design a creature that allows you to use objects outside the game as Equipment artifacts. September 7, 2015 8:39 a.m.
1: If RPSLS is not equipped, you may search any area outside the game for a rock, a piece of paper, scissors, a lizard, or Spock, then put it onto the battlefield equipped to RPSLS. As long as Scissors are equipped to RPSLS, it gains first strike. As long as a lizard is equipped to RPSLS, it gains infect. As long as Spock is equipped to RPSLS, it gets +10/+10 and gains trample. September 7, 2015 8:54 a.m.
Enchanted creature can't leave the battlefield for any reason. I so gud at wording. September 7, 2015 10:32 a.m.
Make an (un)card named "Am I Cool?" with obvious reference to Emrakul. September 7, 2015 12:43 p.m.
Am I Cool? is too awesome to be countered. When you cast Am I Cool?, take an extra cool turn after this one. Flying, Protection from lame colored spells, AnniHIPllator 6 *(Whenever Am I Cool? attacks, defending player sacrifices six uncool permanents. Am I Cool? is too hip for graveyards, so when it's put into one just shuffle it back in that library real quick. Create the next awesome cantrip. September 7, 2015 1:03 p.m.
September 7, 2015 1:11 p.m. Create a modified Phyrexian Negator that isn't terrible and isn't Phyrexian Obliterator. September 7, 2015 5:19 p.m. Whenever Phyrexian Disintegrator is dealt damage, each opponent sacrifices that many permanents and you discard that many cards. Create a card that's name is a synonym with another card name. September 7, 2015 5:25 p.m. Create a non-legendary 5-color creature. September 7, 2015 5:36 p.m.
September 7, 2015 6:02 p.m. Destroy target land. Its controller puts two 2/2 blue Drake creature tokens with flying onto the battlefield. 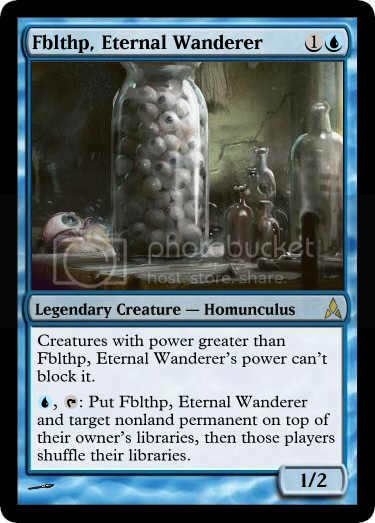 Create an EDH commander who want to be literally anywhere but the command zone. September 8, 2015 1:16 p.m. When Qua-Sal enters the battlefield, exile target creature an opponent controls and return a creature from your graveyard to the battlefield. At the beginning of your upkeep, if Qua-Sal is in the Command Zone, discard a creature card, then you lose life equal to the amount of creatures in your graveyard. At the beginning of your upkeep, gain life equal to the amount of cards in exile. September 8, 2015 2:21 p.m.
Gargantuan of Memnarch cannot attack or block unless you control eight artifacts, have less life then all opponents, and have seven cards in hand. If you would lose life or take damage from a source other than Gargantuan of Memnarch, instead you gain that much life and discard that many cards. Discard a card: you lose 5 life. September 8, 2015 3:24 p.m. When you cast Terrain Reconstructor, you may sacrifice 3 lands. If you do, search your library for a colorless creature card and put it into play. Sacrifice a land: Search your library for a land card and put it into play. Create a "balanced" land card that makes Scapeshift even more broken. September 8, 2015 3:47 p.m. This land enters the battlefield tapped. It does two times the number of Volcanic Basins in play damage to target creature or player. September 8, 2015 3:59 p.m.
Artifacts and lands enter the battlefield tapped. September 8, 2015 6:12 p.m.
September 8, 2015 6:13 p.m. Choose a player. Exile target permanant that player controls, counter target spell, that player discards 5 cards, deal five damage to that player, and destroy all enchantments that player controls. You gain 10 life, return target instant or sorcery to your hand. You may cast that card without paying it's mana cost, draw 5 cards, return 2 target permanents from your graveyard to the battlefield, and gain control of all creatures. September 10, 2015 10:14 p.m.
Next: Create a colorless card that does something entirely different depending on what colors were used to pay for it. September 11, 2015 2:38 a.m.
woah! my mistake I have no idea what just happened I can't even find the post I was responding to. September 11, 2015 2:40 a.m. Whenever Metallica attacks and a metal band is playing, each opponent loses X life, where X is the number of cards in his or her hand. : Choose next the song, any player may activate this ability. September 11, 2015 3:35 a.m. If was spent to cast this card, target player reveals 3 cards from his hand. Choose one and discard it. If was spent to cast this card, target creature gets +3/+3 until end of turn. If was spent to cast this card, deal 2 damage to any number of target creatures. If was spent to cast this card, draw a card, then scry 2. If was spent to cast this card, exile target creature you control, then return it to the battlefield under its owner's control. Next, make a card most color-pie breaking Ally ever. September 11, 2015 4:04 a.m. Create a 7-drop artifact that can completely hurts multicolored decks and doesn't affect mono colored decks at all. September 11, 2015 8:15 a.m.
Multicolored creatures get -1/-1 for each of their colors. Create a confusing chaos card that is actually good. September 11, 2015 9:21 a.m. 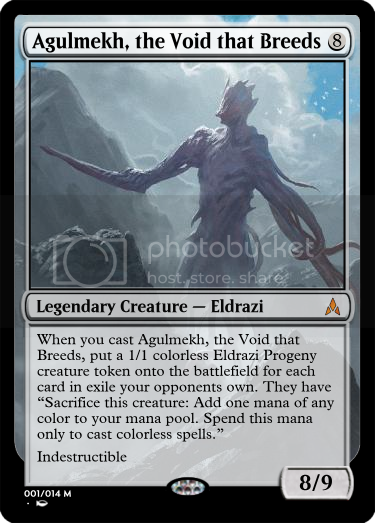 Create an eldrazi that does nothing like an eldrazi from either block. September 11, 2015 9:23 a.m.
September 11, 2015 9:43 a.m.
Make a creature that would build an unstoppable deck in standard. September 11, 2015 9:45 a.m. When Stepp Lion's Power is over 5, it gains trample. Landfall- When a land enters the battlefield put a +1/+1 counter on it. Make a land which would be modern playable that does not have a mana ability. September 11, 2015 9:52 a.m. Tap, Sacrifice Machine Shop: Search your library for a colorless card, reveal it, and put it into your hand. Then shuffle your library. Takes a land drop but can tutor for any land or eldrazi?? borken. September 11, 2015 11:45 a.m.
Each player reveals the top 10 cards of his or her library. For each land a player revealed this way, that player adds to his or her mana pool. For each instant or sorcery a player revealed this way, ~ deals 1 damage to that player. For each creature or planeswalker revealed this way, each of that player's opponents puts a 2/2 blue and red Illusion creature token onto the battlefield. For each artifact or enchantment card a player revealed this way, that player puts that card onto the battlefield under another player's control. Then each player shuffles his or her library. September 11, 2015 12:37 p.m.
September 11, 2015 12:41 p.m. Whenever you would draw a card, you may instead pay . If you do, reveal the top card of your library. If it is a nonland card, you may cast it without paying its mana cost. If it is a land card, put it on the bottom of your library. Next, craft a card that makes losing life benefit you that doesn't have to do with card draw. September 11, 2015 1:41 p.m. Whenever you lose life, Rakdos' Voodoo Doll deals that much damage to each creature you don't control. September 11, 2015 1:49 p.m. Whenever an effect causes you to discard a card, return it to your hand at the beginning of your next upkeep. Whenever an effect causes you to sacrifice a creature, return it to your hand at the beginning of your next upkeep. September 11, 2015 2:35 p.m.